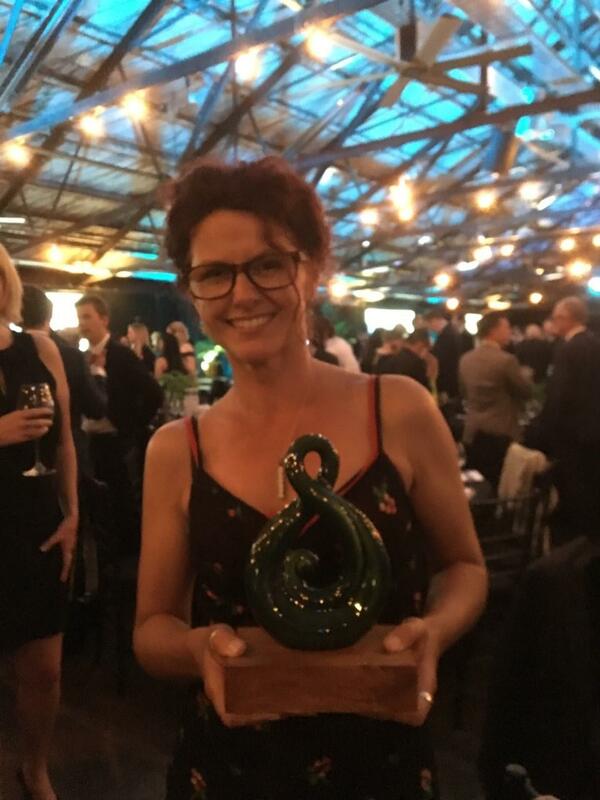 On the evening of 22 November our member Janette Searle's social enterprise Take My Hands won the Partnering for Good Award at the 2018 NZI Sustainable Business Network Awards. The win was achieved in the face of significant competition as other heavyweight finalists in this category included Akina + NZ Post, KickStart Breakfast (Fonterra/Sanitarium/Ministry for Social Development), KiwiHarvest & Living Water Partnership (Department of Conservation/Fonterra). The evening was a big one as well 680 guests with 4 Government Ministers including Ministers Parker, Sage, Nash and Henare. 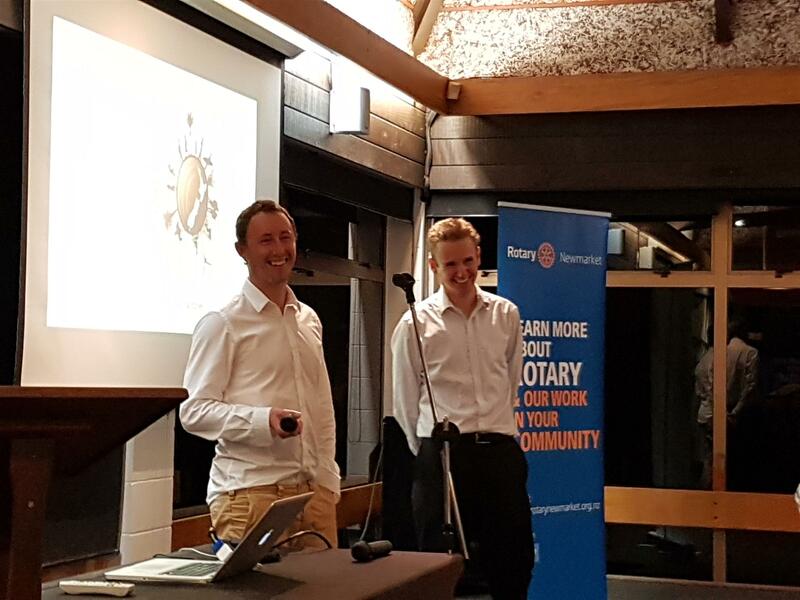 A full house at the Remuera Golf Club was treated to Clint Jones’ enthusiastic explanation of his two passions, both based on his involvement with the New Zealand marine industry. 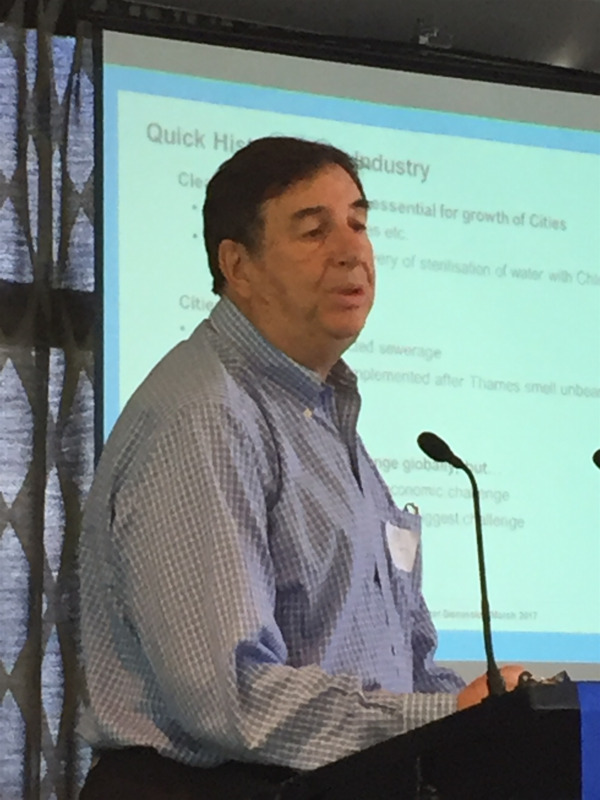 Clint is Managing Director of Oceanmax, the developer and distributor of “Propspeed” an innovative anti-foul coating for submerged metal parts, most notably of use on marine propellers, underwater struts and similar boat fittings. From its origin as a local niche product Propspeed, in a few short years, has become an internationally sought-after brand exported to 30 countries worldwide and has been gathering export momentum. Most recently Oceanmax/Propspeed has twice been named “Vendor of the Year” by US-based West Marine, the world’s largest marine retailer. The company’s rapid rise in the marine market was assisted by grants from both New Zealand Trade and Enterprise (NZTE) and Callaghan Innovation. The operation employs 22 staff in NZ and has five full-time representatives in the USA. Other marketing is accomplished through agency partnerships, other co-operative trade relationships, and increasingly social media. Ever larger market options beckon, for instance planned sea trials on one of Carnival Cruise’s 25 ships as a possible foothold in the commercial market. 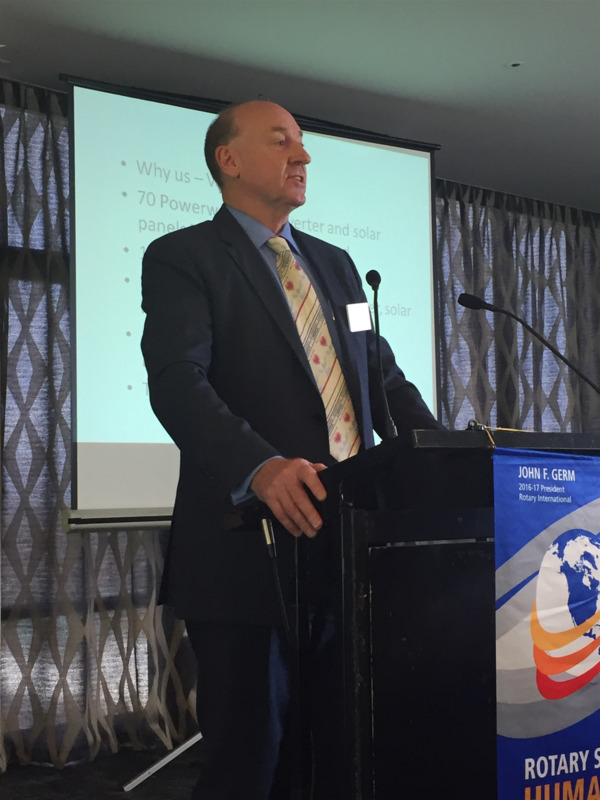 Clint says there has never been a better time to be a NZ exporter. Pres Michelle welcomed guests, friends from the Penrose Rotary club and members for the first meeting of 2018. Our guest speaker was Helen O’Sullivan CEO of Ockham Residential a major player in the Auckland apartment market. Helen gave us an update on Ockham’s activities in Auckland and took us through some of the apartment complexes that it is built in the past few years. 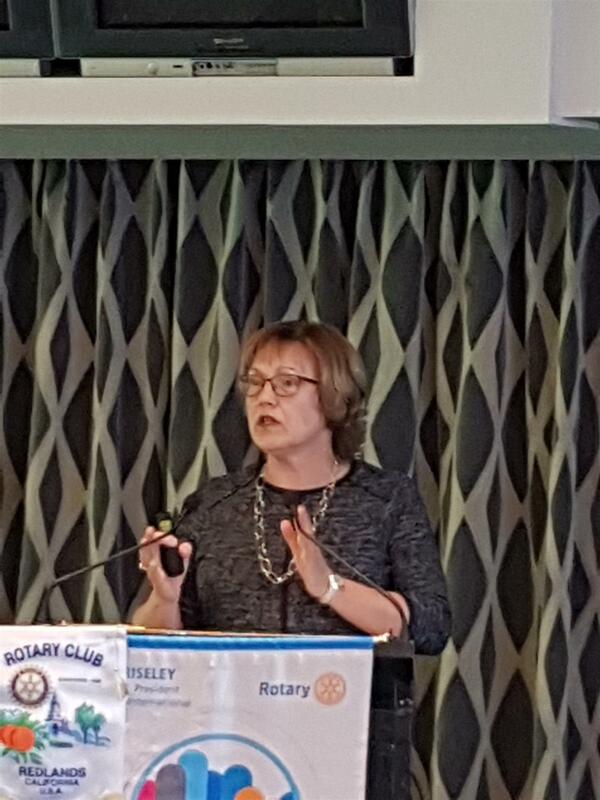 She then closed with a brief discussion on the Ockham foundation what it seeks to achieve and similarities with the aims and objects of Rotary. Ockham’s aim is to provide residential buildings containing affordable apartments but which are built in a world-class manner. are beautiful, appreciated by the local community and improve the local built environment. provide high levels of on-site amenity for the residents of those buildings and their visitors. Are constructed using best practice to ensure residents comfort and minimise ongoing costs. Ockham is taking advantage of the new Auckland unitary plan which makes greater density possible. Some of its buildings are being constructed in places that one would not ordinarily expected multi unit residential blocks to be constructed. “Daisy” in Eden terrace is an example. Helen, as well is being Ockham’s CEO is also owner of an Ockham apartment stop that in itself speaks volumes for the quality of the apartments Ockham has constructed. Ockham foundation supports initiatives encouraging critical thought, independent thinking and attempts to foster a sense of social justice amongst students. Although in its early stages the foundation has funded first foundations scholars studying in the science faculty of the University of Auckland, funded an outdoor classroom and nature trail at Grey Lynn PrimarySchool, funded postgraduate scholarships in statistics at the University of Auckland and is working with Nga Rangatahi Toa and organisation assisting youth excluded from schools to re-enter educational and training pathways from which they would otherwise be barred. Helen then commented upon Ockham projects completed and under construction. These included Hypatia on Khyber Pass, the Turing building in Grey Lynn, Station R, opposite the Mount Eden railway station, the Issac, again in Grey Lynn, Wamka in Ellerslie, the Ockham building on Sandringham Road, Tuatahi in Mount Albert, Set in Avondale, Bernouli Gardens in Hobsonville and finally Daisy again in Mount Eden. This is a fine body of work by any stretch of the imagination. David and Rosemary Bradshaw very kindly hosted our Christmas Party last year. 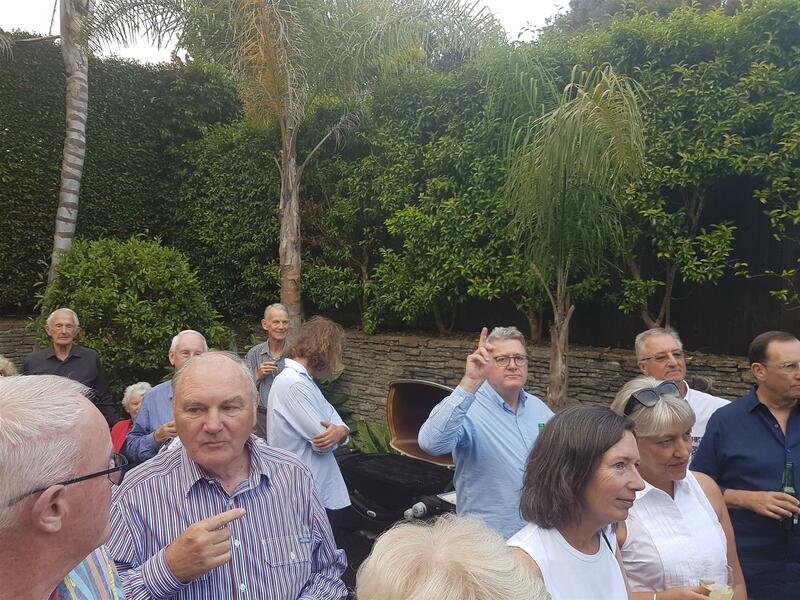 An enjoyable evening was had by all so thank you David and Rosemary for your hospitality. Some photos that I took are attached in no particular order. Sarah Heydon was our keynote speaker. She spoke on behalf of the Auckland Eastern suburbs Riding for the disabled. Sarah is a former member of our club and as a professional director. She as chair of Cavalier Corporation, a director of ports of Auckland, GMS science and the cooperative bank. She is also chair of New Zealand Riding for the disabled. Riding for the disabled has been in existence for over 40 years. The association between Rotary and Riding for the disabled is of similar vintage. Sarah gave us a rundown on what it takes to operate Riding for the disabled in Auckland. An area to ride on as required, there are health and safety issues to monitor, horses to find and train, funding to obtain volunteers to recruit and riders to select. Riding for the disabled relies on pony clubs throughout the country to support its programs. The Auckland Eastern suburbs Riding for the disabled used to be headquartered at St Helliers Bay pony club. However because the land upon which that pony club sits has been transferred to Ngati Whatua who want to use the land for other purposes Riding for the disabled have relocated to the Meadowbank pony club. Riding for the disabled uses a lot of resource. Specialised equipment for the riders which needs to be cleaned maintained and secured. Staff have to be trained operates safely. There are strict operating requirements before Riding for the disabled can be undertaken. For example, one rider needs a horse and three helpers. There are six horses required for a lesson. In addition there is a coach overseeing the process and a physiotherapist. Sarah told us 25 volunteers a week are required. We welcomed repre sentatives of cottonseed for the presentation of the social enterprise award award co-sponsored between Newmarket Rotary and Akina. A short video clip was played setting out how Akina operates. It provides work for migrant woman in the clothing industry. The enterprise sources material in the woman so clothes which are then sold funding the further acquisition of material and so on. The Akina award will go to fund the acquisition of further sewing machines giving employment to women who would otherwise be unemployed. Cottonseed enables women to work, organise how they work manager how they work and gives control to them. As an enterprise that empowers those woman to take control of their lives, something they would not otherwise have been able to do. We were told the women with whom Cottonseed work come from Somalia, Ethiopian, Thailand and Pakistan amongst other places. 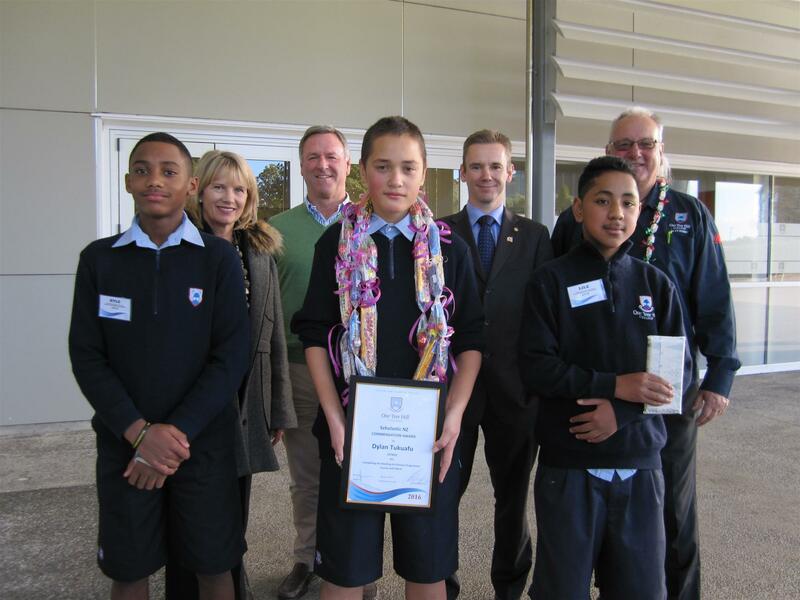 Cottonseed was a worthy winner of the Akina/Rotary Newmarket Social Enterprise Award. Nathan Saminathan gave us an update on the Funraising Committee and, in particular, reminded us about the Garden Design Fest in November. 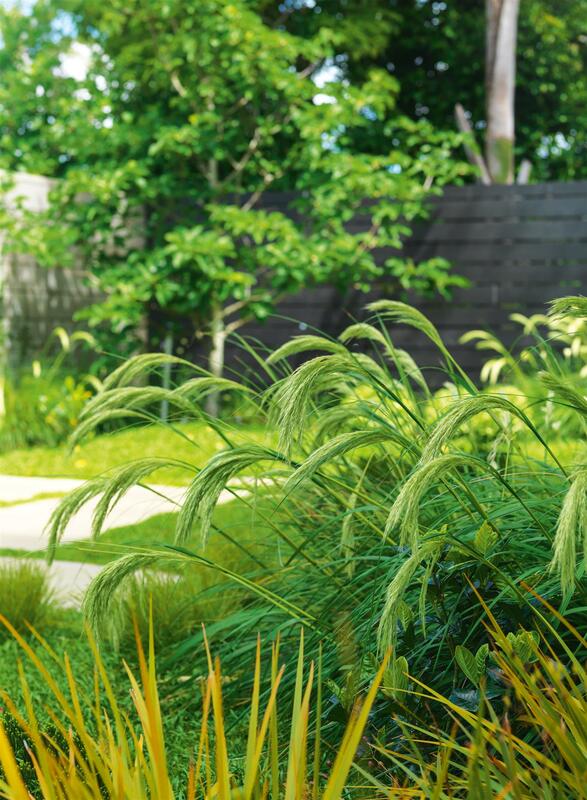 The Auckland Garden DesignFest is back again, featuring some of Auckland’s best professionally designed gardens. This unique weekend festival, November 25-26, allows visitors to meet the designers and visit up to 20 private gardens across Auckland. 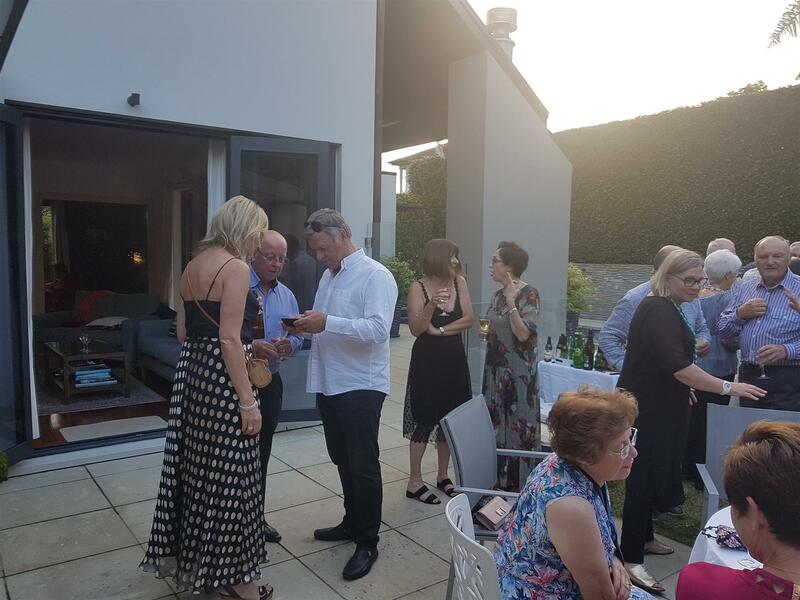 Organised jointly by the Garden Design Society of New Zealand and Rotary Newmarket, the DesignFest raises funds for Ronald McDonald House, Garden to Table and the Rotary Club of Newmarket Charitable Trust. Optional guided bus tours are also available. Tickets for the Auckland Garden DesignFest will be available from 01 July at iTICKET, plus various garden retailers and onsite at the garden gate. Choose from $65 all garden tickets, $10 single garden access or three gardens for $20. See website for early bird ticket offers. Ron Seeto introduced our new District Governor Malini Raghwan in his usual elegant style. 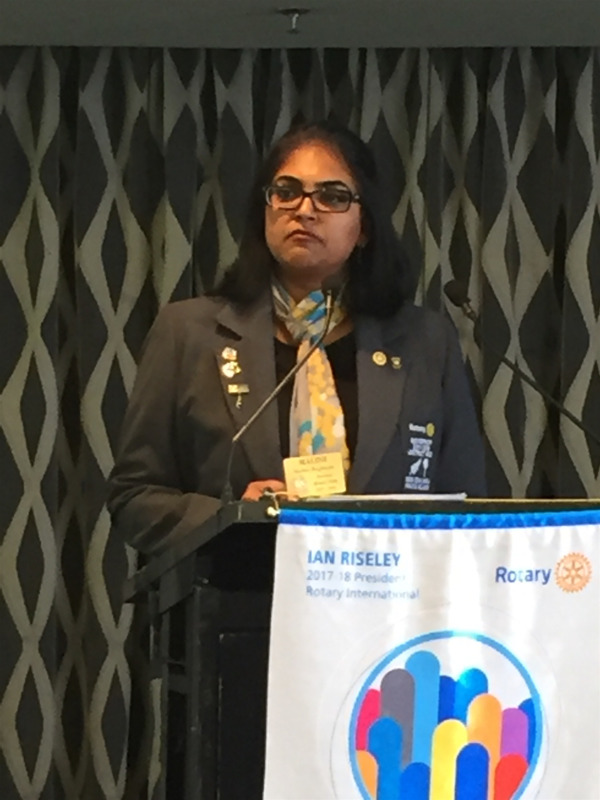 Our new District Governor is continuing to support and strengthen clubs in the district. She highlighted efforts globally to correct gender balance. 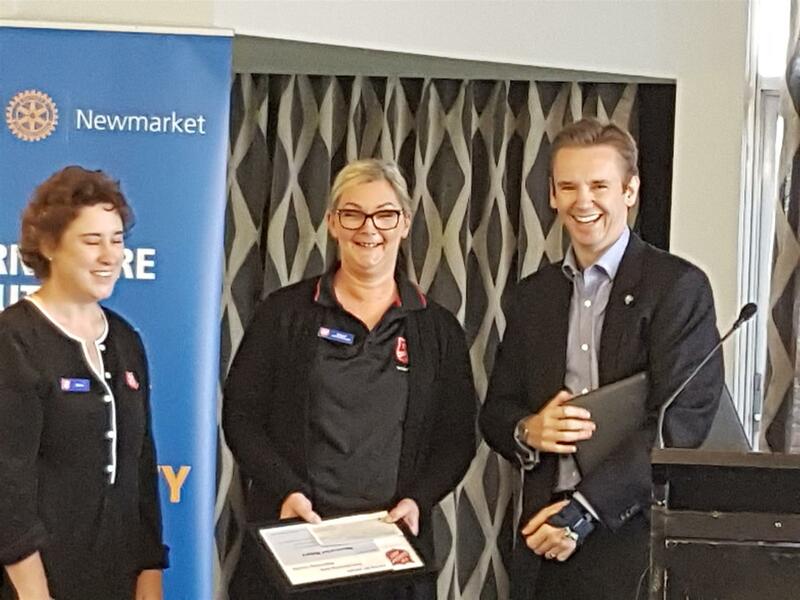 Globally women populate 20% of membership, NZ has 28% but Newmarket has only achieved 5%. 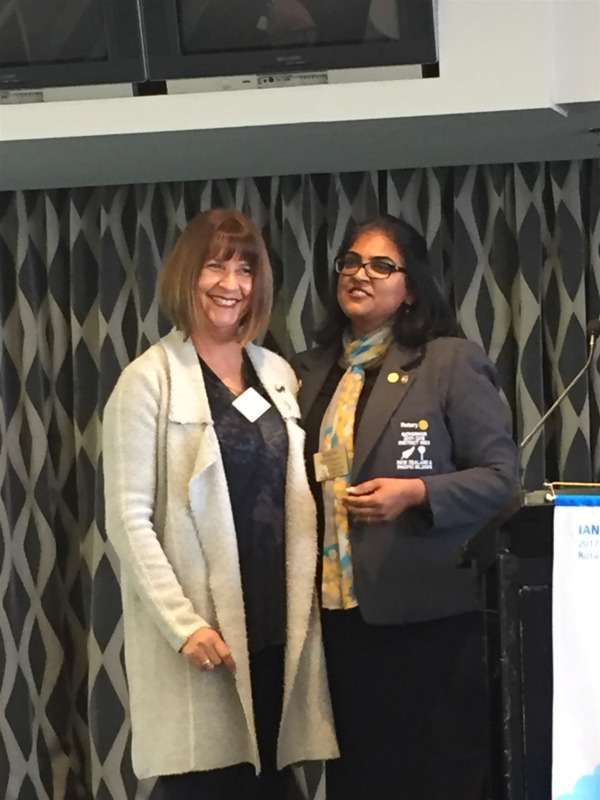 Malini awarded President Michelle with a Women in Rotary pin for being one of the 51 women presidents this year in our district. 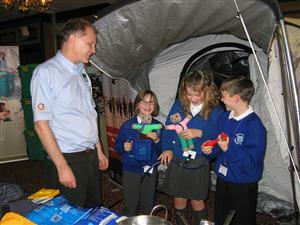 Another problem was highlighted, which was the average age within Rotary which only has 5% under the age of 40. Humanitarian services was discussed and RCON is doing well in this area. We are also doing well with enhancing our public image and awareness and understand the need to boost the Rotary brand. RI President Ian Risely has asked clubs globally to help build better environment stability by planting more trees including mangroves. Another request from Mr Risely is for clubs to log volunteer hours on a weekly basis in the clubs. This is for statistical purposes so we can have a better understanding of Rotary's impact on our communitees. Michelle gave the vote of thanks as well as a gift of a Ruby Seeto tea towel to Malini. 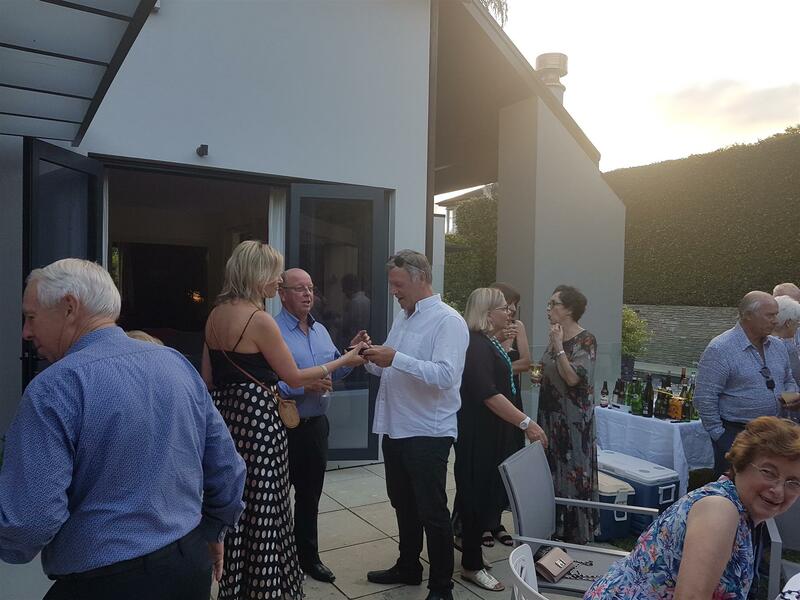 The venue was the Remuera Golf Club. The theme was Movies: Heroes and Villains! It was a fitting end to a good year for the club. We ate. We drank. We celebrated our many achievements. All the while, dressed in some amusing costumes. There were Bat men and Bat women. We had a visit from Darth Vader. Even Donald Trump turned up! This writer will let you decide if he was deemed to be a hero or a villain. Later on, the official chains of office were handed over from a Jedi Knight to Wonder Woman ... I think that says it all. 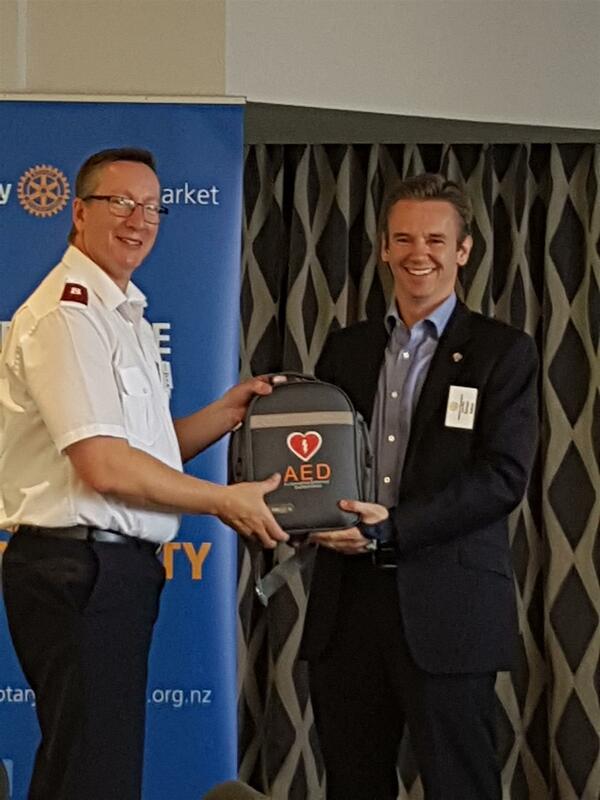 The club is sponsoring AED’s for placement in Auckland. We are putting 5 in various places. The first AED was handed to the Salvation Army for placement in Epsom Lodge. Eric Turner accepted on behalf of Epsom Lodge the AED that we had obtained. In addition, President Simon presented representatives of the Salvation Army in Royal Oak Mission a cheque for $8,000.00 to support the Christmas Hamper Programme. Last year, the Mission produced 450 hampers. The Mission is the second largest food bank in Auckland and offers all sorts of support to those who need it in the area. The people who receive hampers are those who the Mission has worked with. Members received a mini vocational from Rick Buchanan, a past president of the club and presently Treasurer. At the beginning of his address, Rick noted that when he was President, our present President Simon was 14 years old. Rick gave us an interesting background to his life. His father worked for Qantas and so travelled a lot, particularly to the United States. As a consequence of those visits, Rick seemed , together with his family, to be the first to have jeans and all the other bits and pieces that the American’s produced in the 50’s and 60’s. Rick’s mother was born in Tahiti so he has a significant French connection, although on a recent visit to France, he discovered that he had cousins living in Victoria Avenue. Rick is married to Adele. They met in 1969 and got together after Rick completed his University studies and subsequently married in 1792. Rick and Adele have 2 children; Stewart who lives in UK and is a Investor Relations Manager for a Norwegian shipping company and Amanda is married and lives in Auckland. Rick is an Accounting professional. He is a sole practitioner who discovered, after working in the corporate environment and the Partnership environment, that he preferred sole practice. He has been in sole practice in 30 years and loved every minute of it. Rick has been a member of the club for 30 years. There are 15 members who are longer serving than he. Been Treasurer twice for the club and has been on the Board since 1998. He has had the privilege of serving 19 Presidents, which has been a very rewarding and interesting exercise. 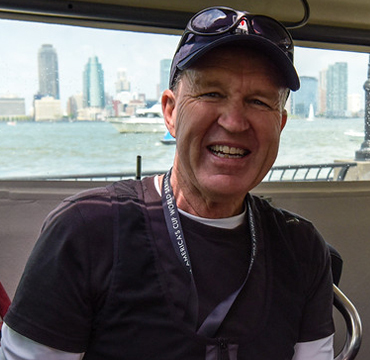 Rotary has brought Rick many rewarding jobs. For example; he recently attended Mt. Albert Grammar School to present a June Grey Scholarship to a female student from that school to enable her to attend or support her attendance at Auckland University. When Rick is not at work or participating in Rotary, he likes watching sports and supporting his family. Welcomed the first of many translocated endangered/severely threatened native species (takahe, tieke) in 2011, a programme that will extend out at least 10 years. Our guest speaker at Tuesdays meeting was Bill Stead. Bill has been involved installing large water projects all around the world. The water business consists of resources, treatment, distribution and wastewater. Roughly 20% of water is lost through distribution. The water business around the world is dominated by 2 French companies, Suez and Veolia. From a historical point of view, the Romans started water distribution. The next big breakthrough was chlorination. The first biological systems were implemented after the Thames began to stink. Today, most of the problems related to water now are political and local challenges, not engineering. Bill has worked on projects such as sewage treatment plans in Guangzhou and water treatment in Tianjin plant and North Ireland. In Auckland, the current problem is that our reservoir was created when there were no suspended solids in the run-off. As the area has grown, clay solids now run off into the reservoir when it rains. Also, much of the other drinking water isn’t properly treated. Roughly 60% of rainwater tanks are contaminated. There are 30,000 cases of water bourne diseases are year in New Zealand. Just announced, Dr Rosalie Stephens, Recipent of the Ross Craig Oncology Award. Dr Stephens will be addressing the club on 13 June, so mark that in your diarys. 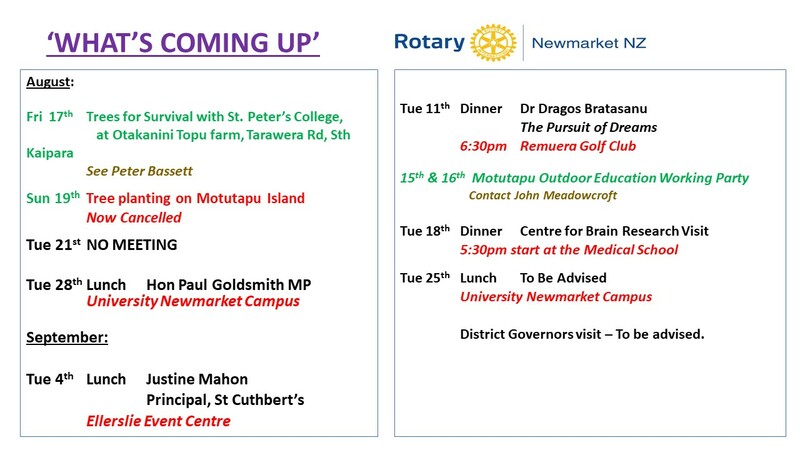 Our Guest Speaker at Tuesdays meeting was Distinguished Professor Paul Spoonley, from Massey University, one of New Zealand's leading academics and a Fellow of the Royal Society of New Zealand. Paul heads the College of Humanities and Social Sciences and presented a fascinating vision on the changing face of demographics that Auckland can expect over the next 10-20 years as the city grows. Paul highlighted that the traditional persona of Auckland and New Zealand as a whole is likely to change significantly as this growing ethnic diversity affects our identity, values and behaviours. Listening to Professor Spoonley it is clear that New Zealand faces interesting times and that the bicultural focus of the past 20 years will be overtaken by a multicultural focus with diversity, opportunity and challenge that is both exciting and frightening. 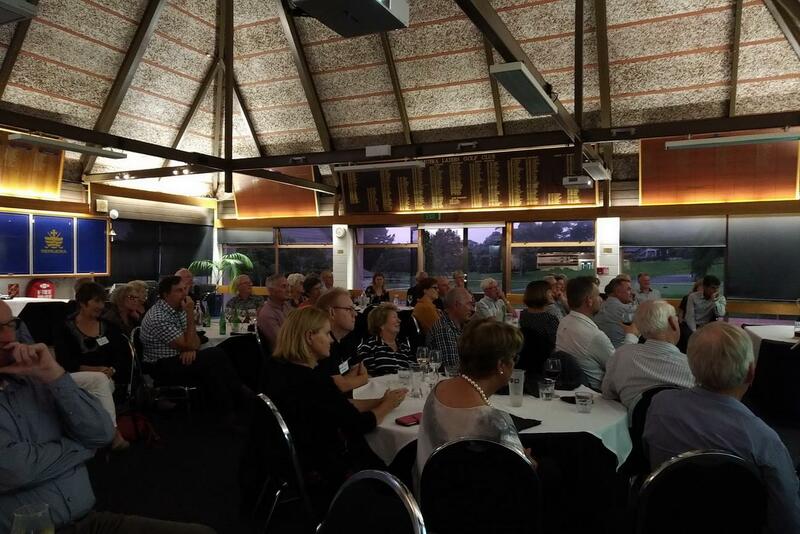 Guest S peaker at our meeting on Tuesday evening at Remuera Golf Club was Guy Ryan. 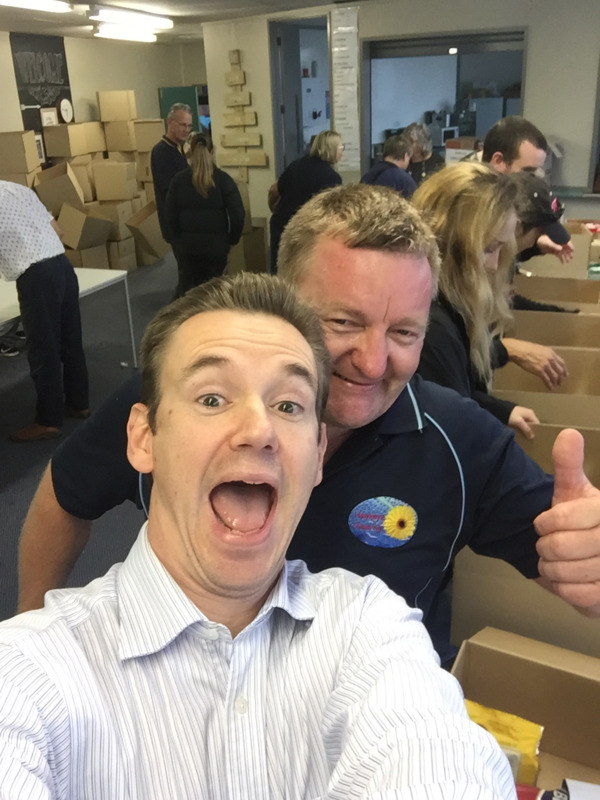 Guy was Young New Zealand of the year in 2015 and is the CEO of the Inspiring Stories Trust. Guy gave us a little of his background. He comes from Granity on the West Coast. He commented that growing up on the West Coast was character building, something seconded by past president Brian McMath himself a coaster. He then attended Otago University fully partaking in the social activities that were available at that institution. It seems he was a bit of a tear away! Guy was one of half a dozen students at his high school who went to university from an initial starting group of 120. As Guy progressed through the University he started to wonder if there was more to life than simply getting pissed at the weekend. By the time Guy graduated he had reformed to become a doer and a bit of an idealist. In his last year University he made a film “carving the future” about young New Zealanders concerned with climate change. That film became a finalist in the BBC best newcomer award in the European wild screen film Festival and was named best short film at the Colorado film Festival. President Simon welcomed members and many guests from sister Rotary clubs throughout Auckland to hear our guest speaker, Dr John “Doc” Mayhew, recently appointed as ambassador to the Rotary District 9920 Heart Savers programme aimed at increasing the number of automatic heart defibrillators (AED’s) available in the community. “Doc” Mayhew is the current doctor to the Warriors NFL team and was All Blacks medico for 15 years on the sideline for 131 test matches and over 200 All Black games. He described his personal experience in 2016 of surviving a cardiac arrest thanks to an AED during a gym workout and noted that without receiving medical attention there is only a 5-10% of surviving. There are currently some 6,000 AED’s in the community and that number needs to be doubled which is where the Rotary Heart Savers initiative has an important role to play. The Pop-up Globe King’s Company presents Shakespeare’s brilliant comedy, As You Like It, at Pop-up Globe Auckland. A young girl and her friend, wanted by the authorities, escape the tyrannical court and find shelter in the ancient Forest of Arden. But they’re not alone. And as the Forest works its transformative magic on all those who seek refuge there, love and life have never felt more precious. Set in the summer of 1642 - just months before the outbreak of the bloody and disastrous English Civil War and the permanent closure of the original second Globe theatre - and performed by a full all-male cast in authentic costumes of the period, As You Like It is an exercise in early modern escapism. The Pop-up Globe King’s Company is Pop-up Globe’s resident all-male company of actors and live musicians, working with world experts to bring you the authentic shock of the old: the effect of Shakespeare’s plays performed in the space and style for which they were written. ​This is a strictly first come/first served basis. I have reserve 40 tickets based on the interest shown. Seating will be Reserve A at $165 each (The posh seats). This is the time of year to think whether you know any 20 to 28 year old future leaders who would be a good prospect to attend RYLA this year. All the Information, including a brochure is available on the website www.ryla.co.nz . Application forms are also on the website or they can be obtained from Richard Solomon. If you have anybody in your life or contacts that you would like to recommend RYLA to I encourage you to put the information in front of them to consider it. It is a marvelous programme as attested to every year by the candidates we sponsor. We will be looking to interview during March and early April so would like to receive applications around end February early March. Criteria and Age range remains the same; between 20 and 28 (inclusive) on 1st May 2017 and already exhibiting leadership qualities and/or potential in their lives. The venue is again Willow Park Convention Centre, Eastern Beach and the format of the week programme is expected to be essentially the same as previously, so criteria such as fitness level and demonstrated leadership potential are keys in your selection process. Please contact Richard Solomon with any questions you may have. 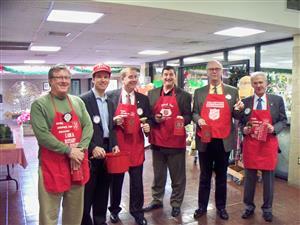 If it is Christmas then it is time for Christmas Hamper packing with the Salvation Army in Royal Oak. A group of volunteers gathered on 8 December and packed, and packed. 306 boxes in total. An awesome job undertaken in a record time. Last Saturday 20 members and partners lead ably by Michelle Smith packed ERKs or emergency response kits for disaster relief. Stamina by re-stocking the production line. The organiser, Don Benson was really impressed and appreciative of our efforts. Our guest on Tuesday 22 November was ACT Leader and MP for the Epsom Electorate David Seymour. 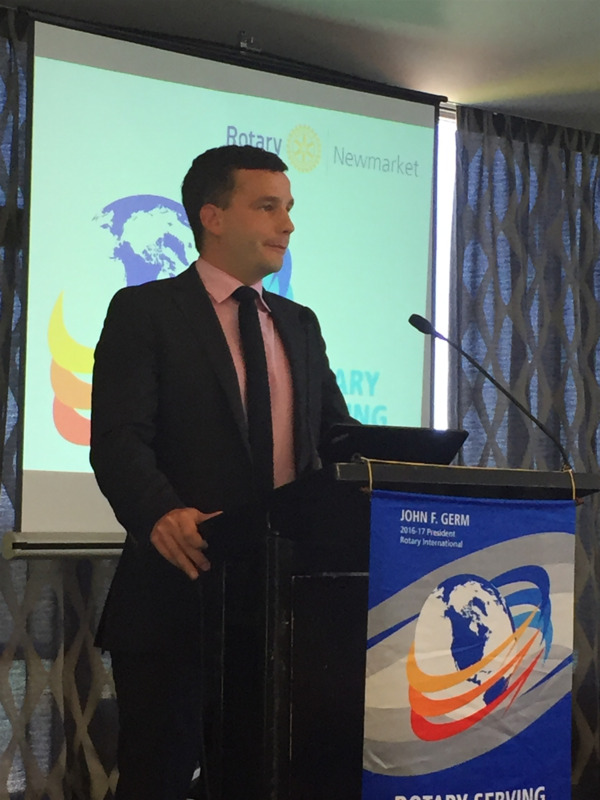 President Simon welcomed members and welcomed guest speaker, David Seymour, our local MP for Epsom and leader of the ACT part. David also serves as Parliamentary Under-Secretary for Educations and Regulatory Reform in the National lead government. David’s presentation focused on New Zealand’s immigration policy which he believes will be the decisive issue in next year’s general election. Net permanent long term migrants are now 70,300 in the year ended October 2016 adding to pressure on housing, employment, healthcare and infrastructure. Total net immigration in the last 5 years is 190,000, which compares to the mid- seventies and early eighties where New Zealand had a net outflow of 155,000 over a five year period. From the mid eighties New Zealand has followed a skills based test for new immigrants which has seen a far broader racial and cultural mix of new arrivals. Brian McMath gave the club an overview of the NRCF. 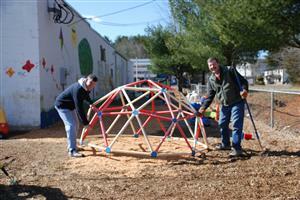 Its purpose is to assist the club in providing stability to the club’s charitable contributions. It was formed in 2002 and now has $1.3 million in assets. The average return has been 6% over the past two years. The NRCF supports activities in the areas of education, health and community support. Contributors may specify areas in which they would like their bequest to be applied. The Burton family, for example, has specified that its contributions go to activities around disabilities. It has distributed $300,000 since 2004. It has a signature program that supports research grants around oncology. Why buy someone a goat in Africa for Christmas? 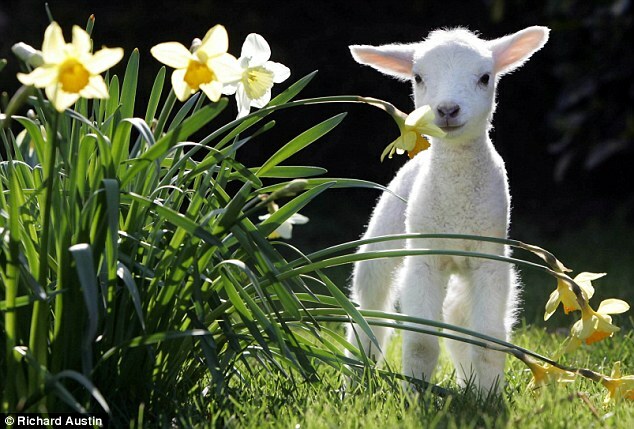 Try buying them trees in New Zealand – after all, goats eat trees! This year one of our Trees for Survival schools planted a wetland site in Taupaki with 300 native trees. We’d like to invite you to sponsor some of these trees as your environmental gift to a loved one this year. We will send you a magnificent handmade card with Christmas decoration outlining this sponsorship, for you to gift to someone. We were taken on a journey by Nathan through his life. Originally from Malaysia, his parents were rubber plantation workers from India. He remembers a very basic but happy childhood with lots of outdoor activities. His parents moved back to India to farm and Nathan made a decision that he was meant for a different life. He went to university and did his BS in Chemistry. He didn’t enjoy the field however and settled on a role as a bank officer in Malaysia. In 1979, he moved to New Zealand with $900 and did his MBA He has had a few businesses and continually educated himself. He did a diploma in insurance services and became a certified financial planner. In 1997, he started mortgage brokering. He has also been a valued member and president of Toastmasters. He joined Rotary to be able to contribute back to society and has been a leader in several cultural organisations. His hobbies are sharemarket and property investment. Club member John Burton presented a vocational. And very good it was too. John became a member in 2008 – after asking Jeff Smith in the car park at Circus Quirkus how he could get involved in such great work!. John was a keen cricketer in his youth, NZ Schoolboys rep and took his prospective wife off to England to play cricket after completing a BCOM at Auckland University. Then returned to the family tea importing business here. After the sale of that business in the early 80’s John set up his won tea and coffee trading empire – initially in competition with his father and brother but later with them John secured the Dilmah tea brand in NZ and has built a long and close relationship with the founders – the Fernando family. John suffered paralysis after a heart operation in 1995 and soon realised that it was the bit at the top of his head which would save him and soon launched in to a new project with his brother starting (and still a part owner ) of the Columbus Coffee chain. John is now working on a succession plan hoping to bring his 2 daughters in to the family business. John claims to have been lucky in life and family - a very positive person and great club member. 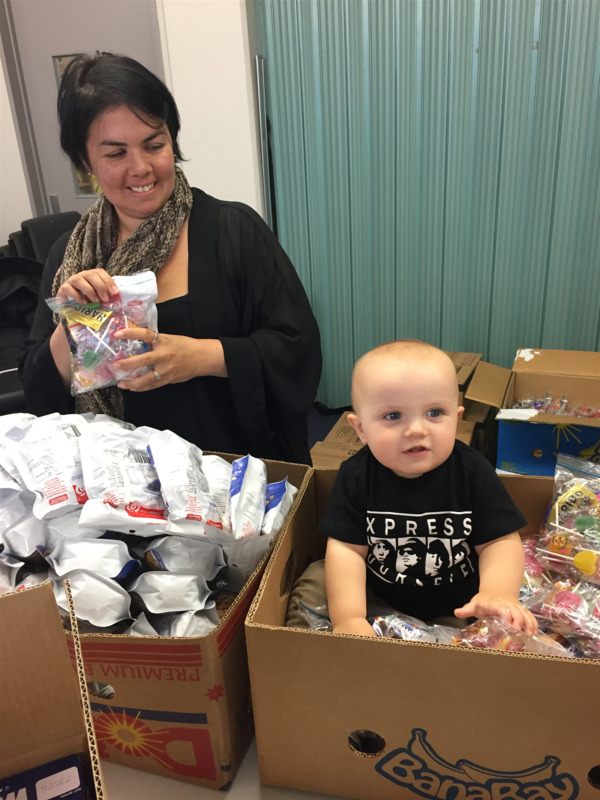 We still require 9 volunteers to pack Emergency Response Kits (ERKS) from 1pm to no later than 4pm on Saturday 19th November at 15 Gabador Place, Mt Wellington. 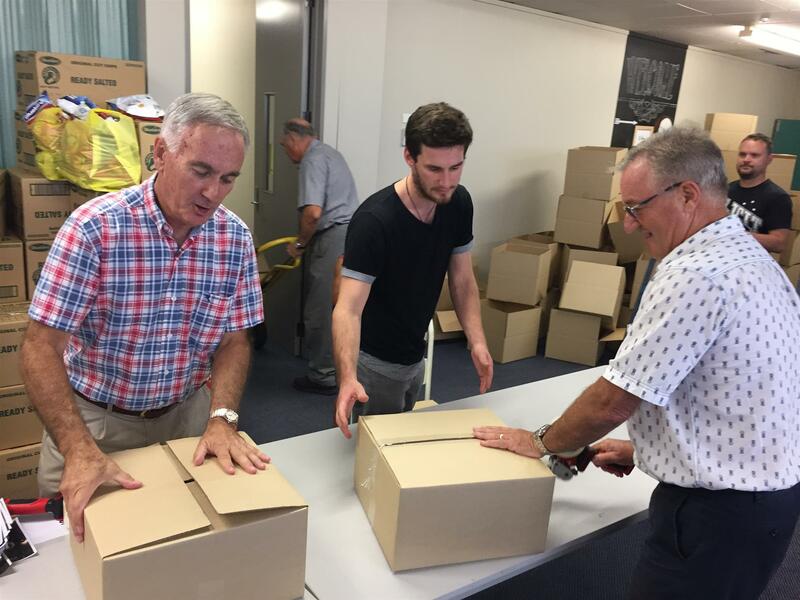 ERKs are vital for Cyclone and other disaster relief in the Pacific Islands and the 2 to 3 hours involved in packing ERKs is small way that our club can contribute to this worthy ongoing Rotary initiative. Currently only 3 club members plus their partners have put their names forward so we only have 6 volunteers at this stage where we require a minimum of 15. Please email Michelle Smith Michelle.Smith@jacobsens.co.nz if you can be there. Family members and friends are also welcome to help. World Polio Day is 24 October 2016. 2. Hold a World’s Greatest Meal (WGM) event or enlist individual club members to host/participate. We are nearly quarter way through our Rotary year and it is time to promote our Conference in May 2017. 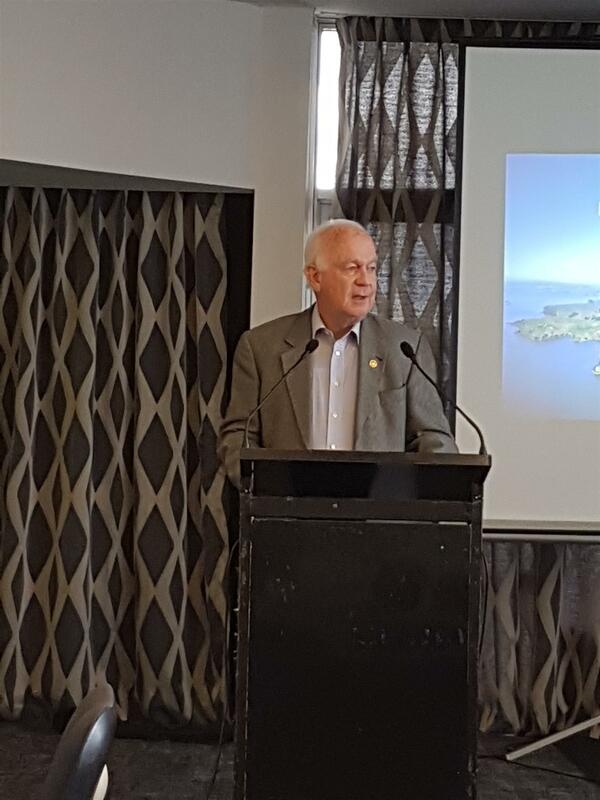 I have chosen Auckland to make it easier and more economical for most Rotarians, Rotaractors and their partners. This is a unique opportunity to experience the breadth and depth of Rotary – along with some novel experiences. * Could you please arrange to put me on your Bulletin address list- for those that haven’t already. * Secondly please ask your Bulletin Editor to include the Flier attached for the next 3 months. * Please also show the Power Point presentation attached when your programme allows. 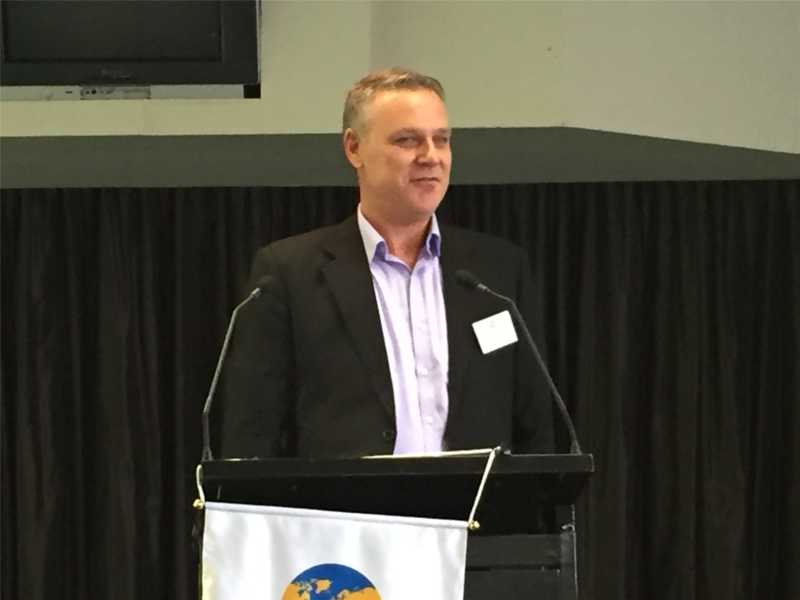 Key note speaker on 27 September 2016 was Loren O’Sullivan, Director of NPH New Zealand. Loren gave a Heartfelt talk about NPH ( Nuestros Pequeños Hermanos). The good news is that Loren is destined to become an associate member of the club. Loren is also ex RYLA giving us further proof and endorsement for that program. NPH is an organisation that provides home and protection for some of the orphans in South America. Emma Stewart from the St. John’s Club. Emma is ex RYLA an Occupational Physio working at the Wilson Home. Emma introduced Westpac Helicopter fund raising programme thru a 15km Rescue run. The cause is great the course is tough Emma needs your help. To donate go to Everyday Hero Account. At our meeting on Tuesday a presentation was made from our Charitable Foundation to sue Giddens of the Neurological Foundation for $10,000.00. Following receipt of the cheque sue gave us a brief update of the work of the Neurological Foundation and in particular a project that is being undertaken in conjunction with the Otago University looking into the ballistics of head injuries. This is an important study as there is pretty solid evidence (anecdotal) that suggests that high impact sports such as rugby, league and in the US professional football leave players with significant neurological problems in later life. Jeff gave us an update on the activities of this committee. RC $3000. These donations have with matching funding from District have given us the ability to purchase more chairs for the project. President Simon gave us an update on the Habitat project being undertaken in conjunction with Habitat and St Cuthberts. The site has been selected – It is beside the Caltex Petrol Station on Broadway. The website for the event will be live in 2 weeks time. The next part of the process is getting sponsorship. The build project will take place in April next year with the site being available from 27 March 2016. And most importantly Habitat is now looking and interviewing for the right family for the house. As mentioned in last weeks rapport, Habitat for Humanity have asked members to complete a survey on the activities of Habitat. Please see the attached survey created by Habitats research agency, Impact Research New Zealand. The survey will take approximately 10 minutes to complete and is an opportunity for all your members to share their thoughts and help shape our new potential services, regardless of whether they are a landlord or not. President Simon and Brian McMath visited Somerville Special School in Panmure to donate to it on behalf of the Rotary club of Newmarket charitable trust a 3-D printer. He made the comment that the pupils at the school worked out how to use this device faster than some of the teachers. He also reported that Alan Hayward is fully personnelled for the blood pressure campaign. Leana Hunt gave us a brief presentation on Habitat for Humanity. Leana gave us an overview of what Habitat does in the community. It is a not for profit organisation that works in partnership with people of good will and families in housing need, to eliminate substandard housing. 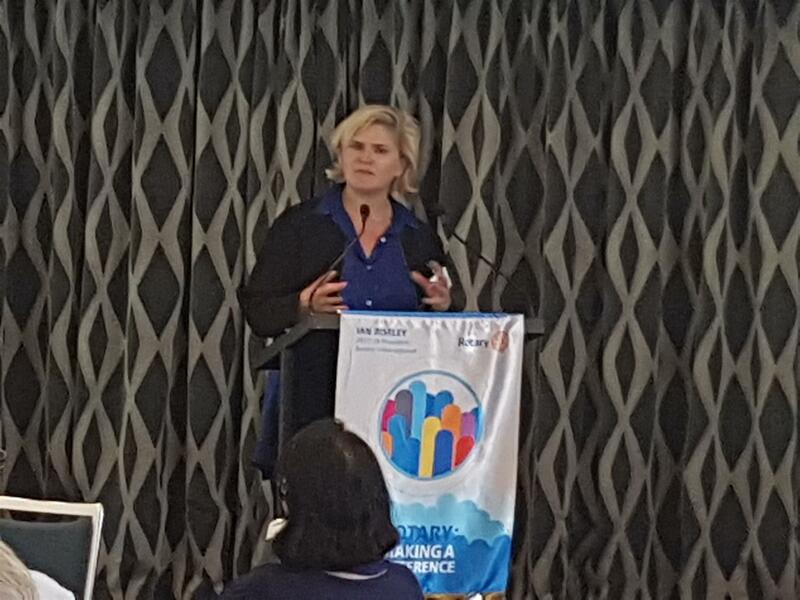 Our keynote speaker was Julie Shepherd from the Kids Can Charitable Trust. Julie gave us a background on the trust which was founded in her garage in 2005. Being aware of media reports on New Zealand Children going without basics she undertook an evaluation of 80 low decile schools to see if the problem reported in the media was as bad as it was said to be. The evaluation established that children at those schools were going hungry, not wearing shoes and turning up wet and cold in bad weather because they did not own raincoats. In the evaluation schools reported that this had a major impact on the childrens learning ability, esteem and health. The downstream effect of this is that these children become ill more often, do not succed at school and as adults are more likely to be unemployed and have children who go through the same cycle. Thank you to all that participated and helped with the organisation of this event that was tricky to put together. Special mention to Roger Gower, who took over the middle session, and those of you that dragged in last minute participants including John Hawke and Martin McGahan. The event will hopefully bring approximately $4,000 into the trust. 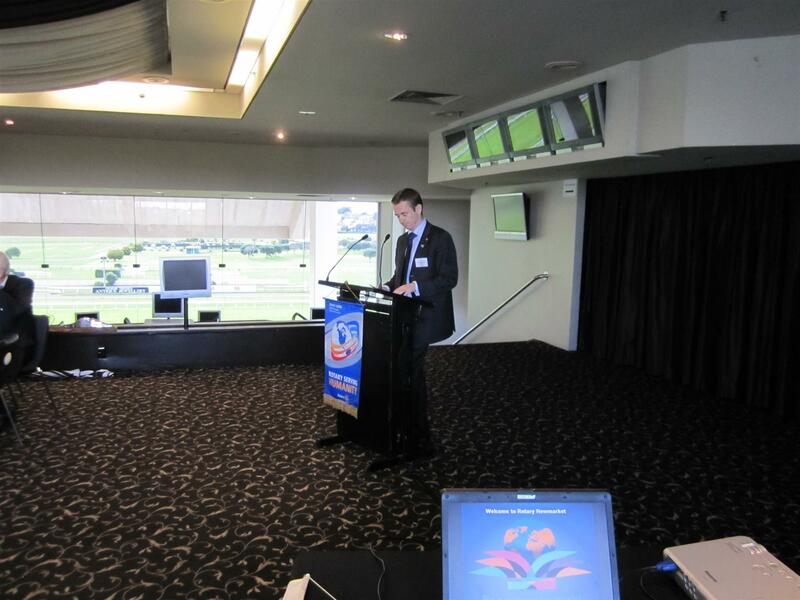 Our keynote address was given to us by RCON member James Carmichael. 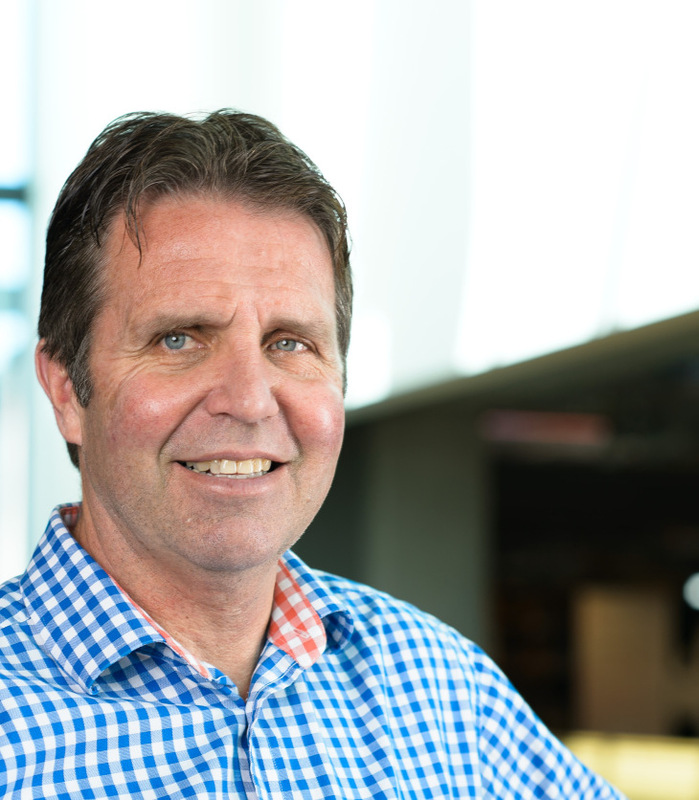 James has been involved in power companies for his working career is a Trustee of Entrust (formerly the Auckland Electricity Consumer Trust) and sits currently on the board of Vector. In that capacity, he visited Tesla in July 2016 as well as Uber's head offices . Vector is Tesla's largest foreign customer. Brian McMath gave us a mini vocational. Brian comes from Greymouth. His father was an accountant in the town. At our meeting on 23 August 2016 we hosted Graeme Cameron, Dennis Millard, Murray Willis and Ian Willetts from Auckland East Rotary together with Gary Hayes from the Rotary club of Epsom. Graeme assisted by Dennis Murray Ian and Gary spoke to us about the breakfast club which is an ongoing project for the provision of breakfasts to children attending decile one schools on the Auckland region. Our keynote presentation was given by RCON member and past-president, Roger Gower. Roger recently went on a trip to Israel which he called a “start-up” nation. The New Zealand travel group consisted of 54 people from various backgrounds. He explained that many of the impressions that we have of Israel from the news weren’t correct. It felt like a safe and open environment where peoples of all cultures mixed freely. Roger visited a number of sites including the Wailing Wall and the Holocaust Museum. He visited the city of Beersheba which, in the war, was a turning point to formation of state of Israel and created a lot of good will by the actions of Australia and New Zealand troops. Israel is great at generating start-ups. They spend 3.5% of GDP on R&D compared to .5% in NZ. NZ is OECD laggard. Roger pointed out that the government and small business are in-line or over the OECD averages for R&D. The main issue is spending by businesses over 250 people. Israel has a highly developed ecosystem for innovation. They have 18 incubators to fund start-ups that are too risky for regular investment. Each incubator has 8 companies in each ( 4 companies per annum for 2 years). The attitude is the generated IP can be the win even of the business fails. Neal Swanney gave us an update on the fundraising committee’s activities. The committee is looking at other fundraising options over and above the clubs annual major fundraiser – Circus Quirkus. The reason being that whilst Circus Quirkus has been successful in the past and is a consistent fundraiser may not be for the future. 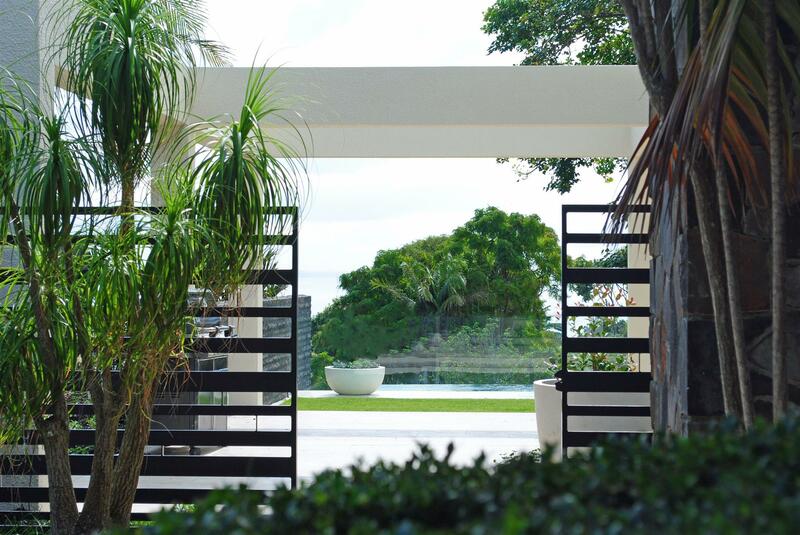 That is why other options such as the Garden design fest in similar are being explored. Additionally fundraising dinners or lunches are being considered along the lines of last year’s rugby dinner which was a success by any measure. The committee is looking at the idea of a function to celebrate a book launch and is contacting publishers and others in the publishing industry for that purpose. 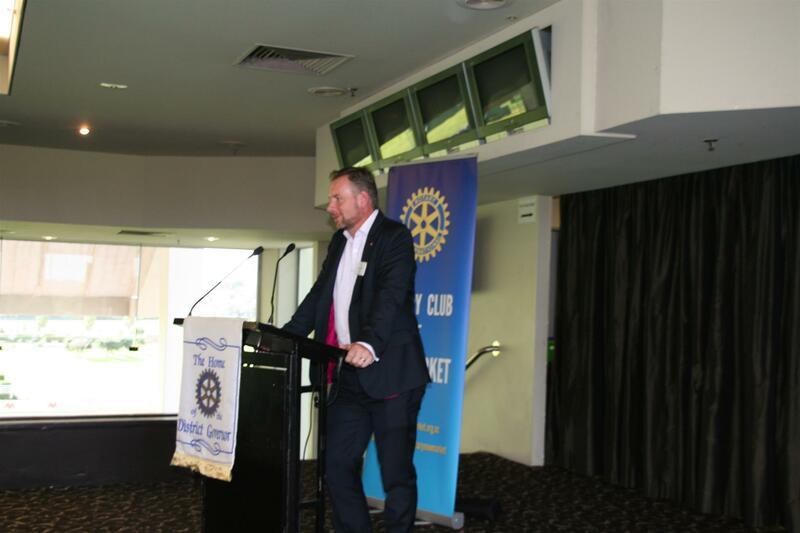 Our speaker on 9 August was Andrew Barnes founder of Perpetual Guardian which is an amalgamation of perpetual Trustees a South Island trustee company and the New Zealand Guardian trust Co Ltd.
Andrew was a director and founder of Just Wills Holdings Limited may multinational will writing and estate planning business. Prior to that he was involved in investment management and advice with Best invest, a UK management company and also Australian Wealth Management Limited. Andrew has moved Perpetual Guardian away from providing financial advice and Wealth Management and returned the company to a fiduciary services model. To complete a busy evening, Richard Solomon introduced 10 of the 16 Club sponsored participants in the most recent RYLA course who then individually presented their comments on the impact the course had made on them. Click on this link to see all the photos from the evening. 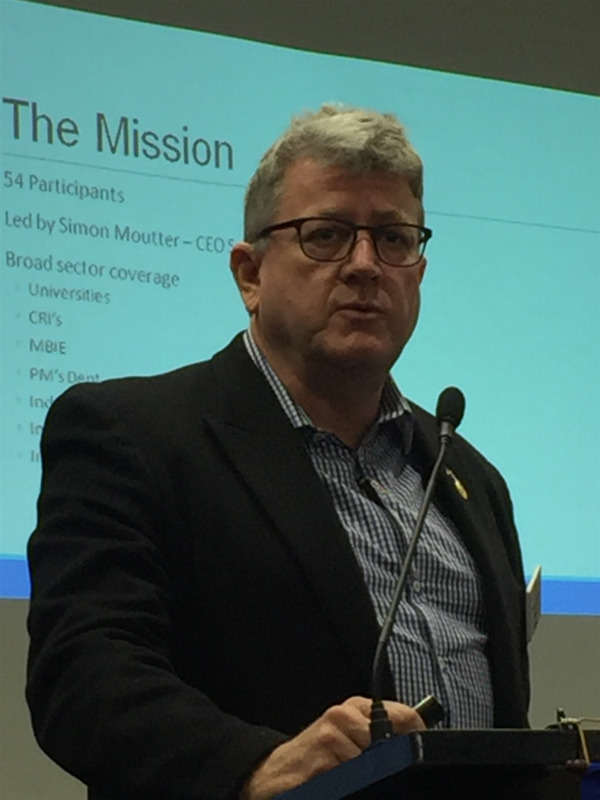 Brian McMath provided an update on the ROCON Charitable Foundation which has been very successful in its fund raising, governance and investments and currently has accumulated funds in excess of $1.1m. Two recent new initiatives involve our long association with the NZ Neurological Foundation and in association with the June Gray Charitable Trust the Trust has set up a $10,000 Research Scholarship. First recipients are two Otago University Professors who will are going to build a skin/skull/brain model that will measure impact forces to the head and brain. There are increasing reports linking mild traumatic brain injuries to early onset dementia. Often these minor traumatic injuries have no clinical symptoms and are difficult to diagnose, hence no minimum thresholds have been established. It is hoped that the research will provide international collaboration opportunities as it is a novel but globally relevant topic. Murray Thom, was the keynote speaker for the evening. A serial entrepreneur, Murray’s boutique music company, Thom Music, has enjoyed great success and two of his productions: ‘Together’ and ‘Miracle’ have both featured on the Oprah Winfrey show. The 'Together' 10 CD Collection was named as Oprah’s 'Favourite Thing of the Year” and another show featured ‘Miracle’, a collaboration with Celine Dion and photographer Anne Geddes. Murray was named one of New Zealand’s Top 10 Entrepreneurs of the decade by NZ Business magazine. Murray is also a past Trustee of the “Play it Strange’ trust and was a presenter to the recent RYLA course. NRCF Funds Research by the Neurological Foundation. NRCF with the June Gray Charitable Trust is funding the building of a skin/skull/brain model that will measure impact forces to the head and brain injury mechanism. There are increasing reports linking mild traumatic brain injuries to early onset dementia. Often these minor traumatic injuries have no clinical symptoms and are difficult to diagnose, hence no minimum thresholds have been established. Glenn is the Managing Partner of SureFire Search Marketing a search engine optimization (SEO) company. This company aims to ensure customer websites are delivering the expected results to the owner; customers are able to find the company through search and are converted to sales leads and so on. An inveterate ultra distance runner Glenn has completed many marathons and ultra marathons, often raising charity funds through wearing fancy dress – tutus and tuxedos included. It was pleasing to see another beekeeper added to the Club ranks. Glenn is married to Anna and they have 4 children. Glenn’s daily maxim is: “To make a positive difference in someone else’s life every single day”. 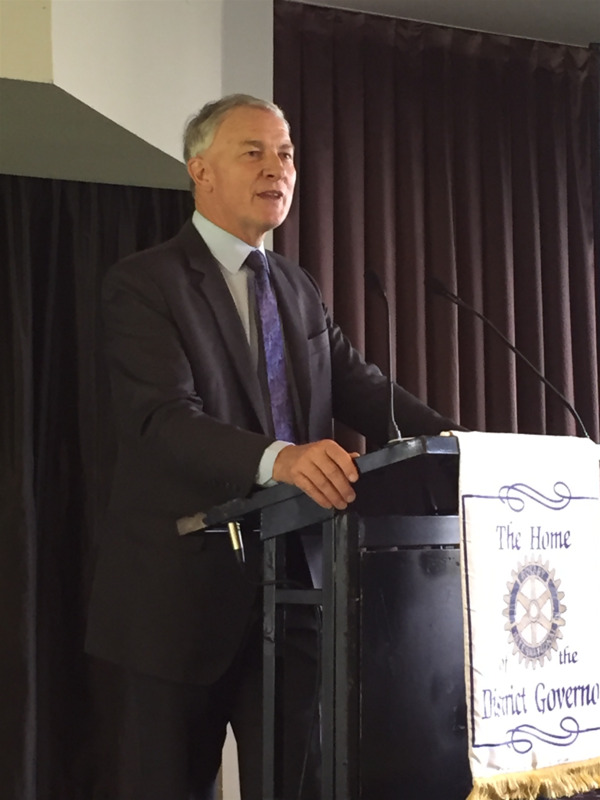 Mayoral aspirant Phil Goff began his address by reflecting on why he wanted to continue serving in a public capacity after 30 plus years in the public eye. His rationale was that his reasons included wanting to make a difference and a preference to be a positive force for good (noting Opposition has its frustrations and limitations). 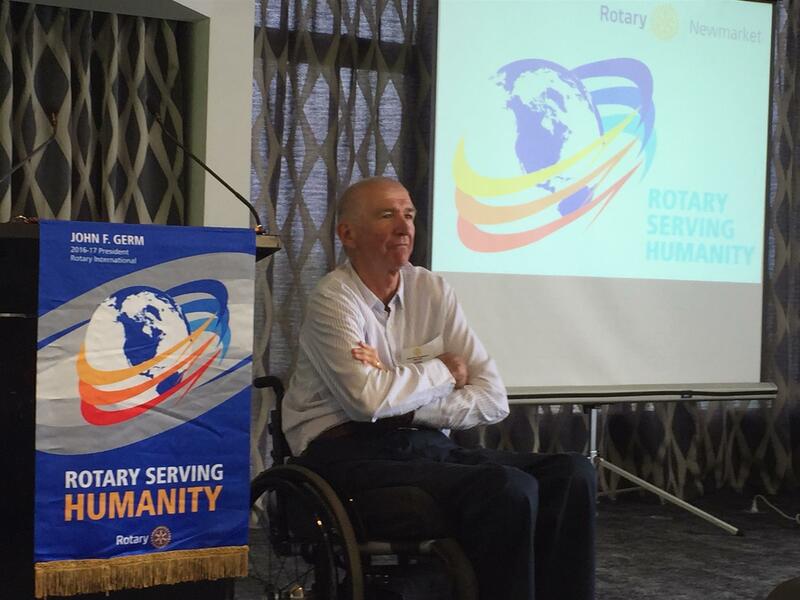 At our meeting on 12 July 2016 we hosted Roger Harvey in his capacity as District Governor for our Rotary District. Roger was supported by his wife Georgie and Assistant Governor Pam Deal. Roger’s Visit Was His 2nd DG, leaving him 53 to do. Rogers address covered a number of topics. He reported on his visit to RYLA which was a superb event. He told us of his visit to the Rotary International conference in Korea where there were thousands of enthusiastic Rotarians in attendance. Roger told us he ate a lot of kimchee. He didn’t say however whether or not he liked it. Our meeting on Tuesday 5 July marked the beginning of President Simon’s year. President Simon reported on his visit to One Tree Hill College to attend the graduation ceremony for participants in the Rotary Reading Enrichment Program which is supported by our club. Read Simon's thoughts on the day here. He also congratulated Ross George on his 50 years in Rotary. 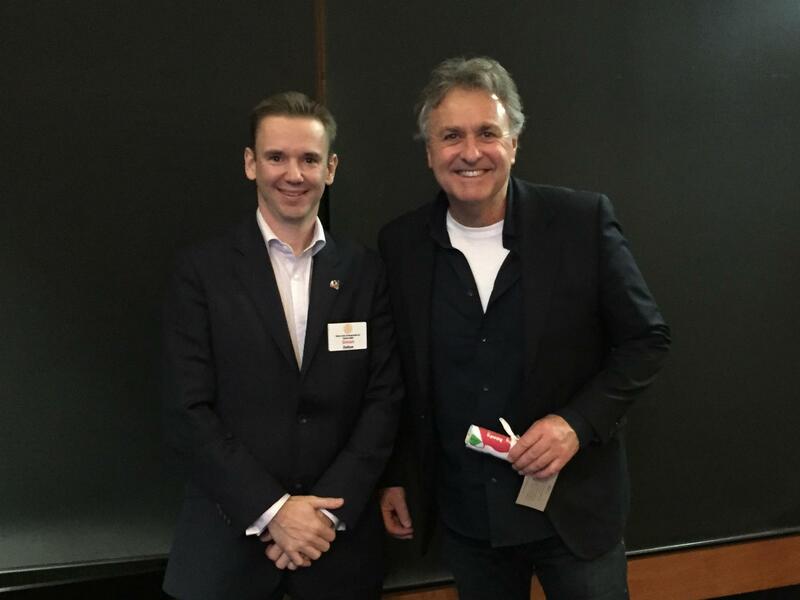 We had an update from John Mitchell on our Habitat 4 Humanity project followed by our keynote speaker; Mark Thomas. This was my first official function as the President of Rotary Newmarket. While I knew a little bit about the Rotary Reading Enrichment Programme, I don't think I've ever truly understood the benefit of it. 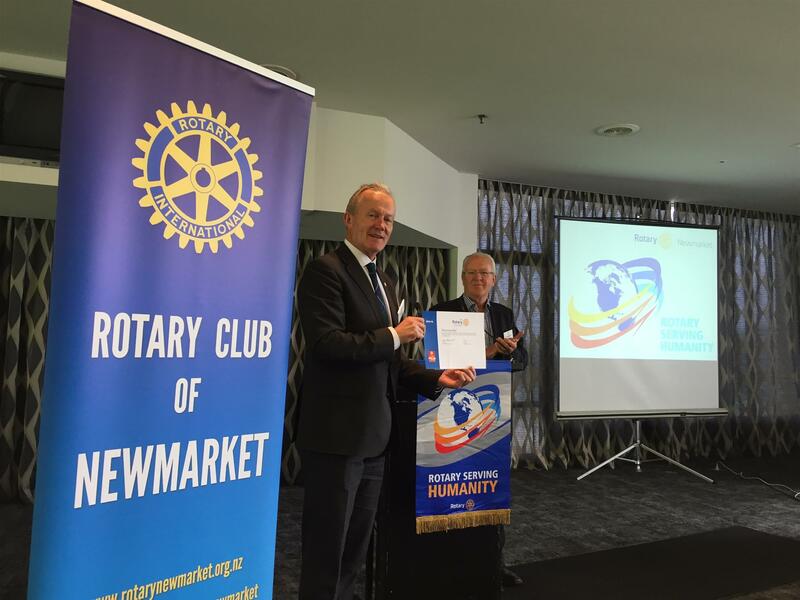 There are numerous Rotary projects that Newmarket, along with many other clubs, give time and money too. It becomes difficult sometimes to see the wood through the trees so it was a great opportunity to see first hand what effect this programme inparticular actually has on our community. So, representing Rotary Newmarket and the Newmarket Rotary Charitable Foundation, I joined fellow Rotarian John Meadowcroft, representing the Lois Dalley Charitable Trust, on a trip to the graduation ceremony at One Tree Hill College. But, before I tell you about my thoughts on the event, its perhaps worthwhile explaining what this particular programme is all about. 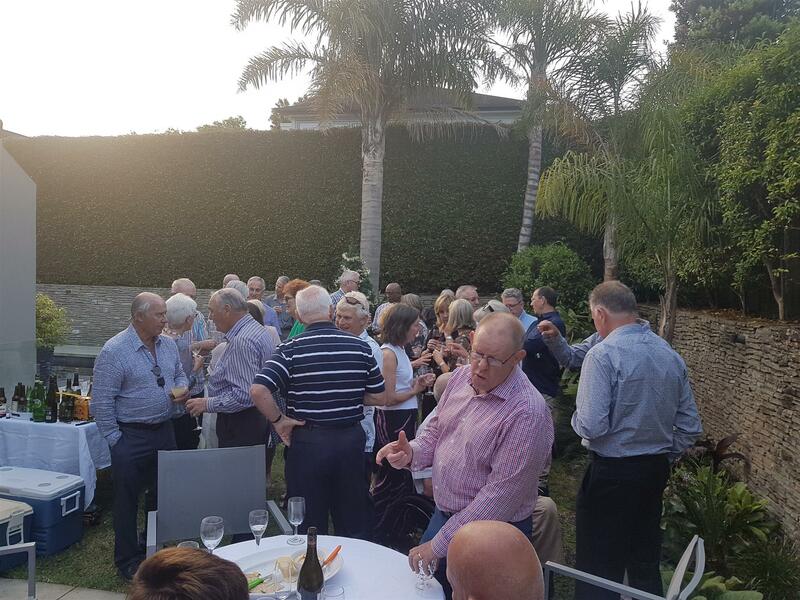 Change over on Tuesday night was celebrated by 65 members, partners and guests at Sorrento. 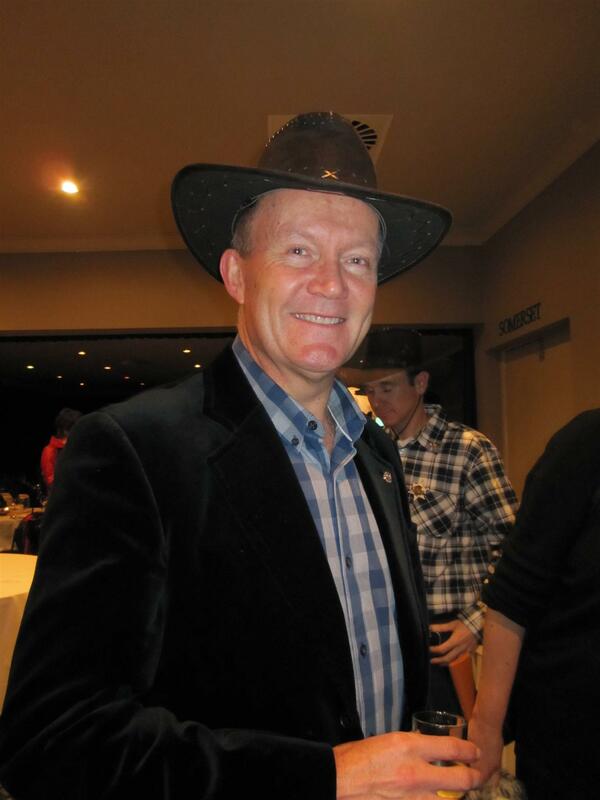 A great night was had by the assembled Cowboys, Cowgirls, Sundries (including Ron (White Trash) Seeto) and Cows celebrating the end of President Patricks year and the start of President Simons. President Patrick celebrated the change over by awarding Paul Harris fellowships to John Burton and Jeff Smith. President Patrick also awarded PP/PDG Ron Seeto a second PHF Sapphire. The evening is best described in the photos taken at the event and which can be seen by following this link. Our speaker today was James Gray the owner of Canary Enterprises. 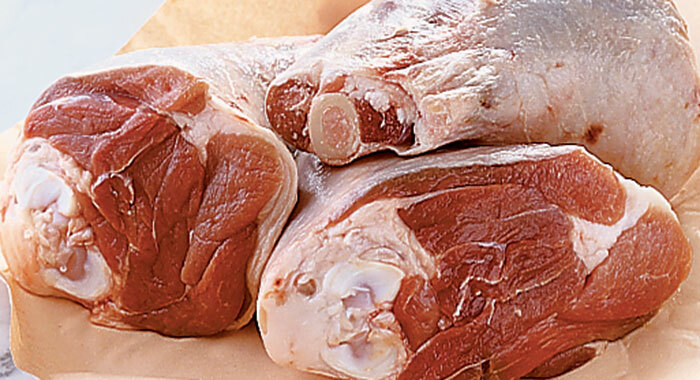 Canary Foods is a manufacturer of value added dairy products and aimed at export markets. Established in 2001 in Hamilton, Canary moved to a new factory in 2008 and have continued to expand. Their primary business is to take commodity unprocessed butter and turn it into fabulous food, for the food service and restaurant trades. As James said, they “Turn boring into Amazing”. Their initial business was making butter medallions at the rate of 10, 000 per day and they are now at 200,000 per day. The business takes 3,000 tonnes per annum of commodity butter and produces a range of innovative products from medallions to sheets, briks (sic) and ingots – all with specific requirements of the commercial and chef customers . A big break through was getting an order from Thai Airways for butter medallions embossed with the Thai Airways logo in 2004. Wonderful evening of celebration at The University of Auckland at the graduation of the Certificate in Health Sciences. 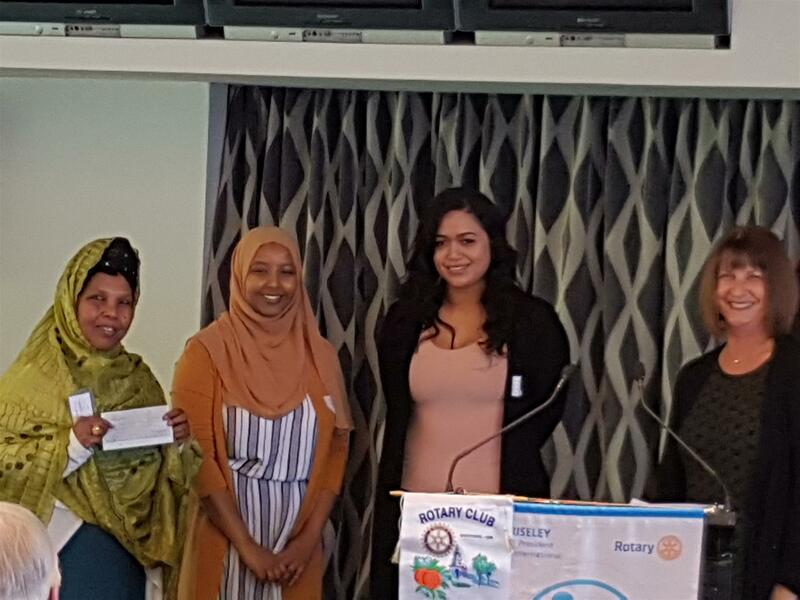 The Newmarket Rotary Charitable Foundation (NRCF) presented the Harold Titter Award for the top student to Mostafa Youssef from Samoa. It was great Harold was able to attend. The award in Harold's name recognises his work as a founding trustee of NRCF and his role as a former Commissioner of the Auckland Area Health Board. In this role Harold recognised the need for more Maori & Pacific Island Health Practitioners which was the genesis for our award. Note: Harold was appointed Commissioner by the then Health Minister Helen Clark who sacked the Board which included her husband. — with Harold Titter at The University of Auckland. We are delighted to announce Sir Richard Taylor co-founder of Weta Workshops is our 3D Printing Ambassador for our project putting 3D printers into primary schools. We are encouraging all Rotary Clubs to get involved with their local schools. Richard has just been interviewed by Mike Hosking on Newstalkzb and in the video he explains why this technology is so vital to our young people and why he accepted the role as our Ambassador. Great start to the year with our guest speaker Dr Jon Mathy the 2015 Newmarket Rotary Charitable Foundation Ross Craig Oncology Awardee. Wonderful to have Ross's son Keith Craig attending. Dr Mathy is a plastic surgeon at Middlemore Hospital & our Award facilitated him to work in the cancer research lab of Professor Cris Print. @aucklanduniversity. The award is named after the late Ross Craig a past District Governor & founding trustee of the Newmarket Rotary Charitable Foundation. Funding for the award is a partnership between the Chenery Trust chaired by Peter Ross, the June Gray Trust chaired by Brian McMath & the Newmarket Rotary Charitable Foundation. — with Peter D Ross, Jon Mathy, Keith Craig, Brian McMath and Brian McMath.